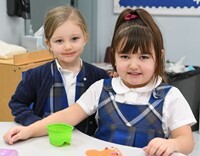 Uniforms are an important part of the way we remain connected as a school community. 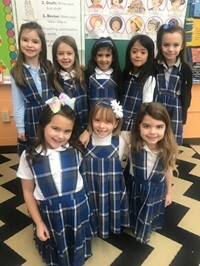 When wearing The St. Barnabas School Uniform, inside and outside the school, students represent the school and their behavior should be a credit to themselves, their families, and the school community. We ask that all parents and students adhere to the uniform policy outlined below to help our school community retain this important part of our identity. A student who wears a visible item that is not specifically permitted by the dress code is in violation of the code. Students violating the code will be asked to provide written explanation from a parent. If a written explanation is not provided, parents will be called and further action may be taken. The PTU sponsors Uniform Exchange events throughout the school year, where new and gently used Uniform items are available for a small fee ($10 or less per item.) You do not need to bring an item to purchase an item. The Uniform Exchange Chairperson may also be able to accommodate a special request, outside of the scheduled sessions by appointment. St. Barnabas School has contracted with two uniform vendors to provide our families with a variety of options. St. Barnabas recommends that you purchase your items from one of the two uniform vendors listed below, as all items in these school shops are approved for use at the School. Mrs. Shauna Kaminsky: 330-468-6941 (Office); 216-548-0966 (Cell). Texting is suggested. The administration of St. Barnabas School has the ultimate authority to determine the appropriateness of ALL attire, hairstyles, accesssories, etc., worn to the School on days the School is in session. Note: all items in the St. Barnabas school shops on School Belles and Lands' End websites are approved. Belt (with slacks or walking shorts): dark brown or black Socks must cover ankle; cannot be worn with tights. Examples include Sperry, Converse, Vans, Toms, Roxy, Adidas, Sketcher, etc. Closed-toe and closed-back; must be tied at all times. Required for all students in K-8, to be worn to school all day, on the day(s) the student has gym class. Makeup, nail polish and perfume are not permitted. If you have questions or want to confirm your item complies with the Uniform Dress Code Policy, please email Mrs. Faetanini – you can even attach a picture of your item!